In the early 1840s, Richard Donovan left his home in County Cork, Ireland, for adventure in America. He settled in Garryowen, Iowa, where he raised a family. We are his descendants, and this is our story. On September 16, 1893, a group of settlers estimated to be around 100,000 strong, awaited the opening of the Cherokee Outlet. At high noon on that day, the Land Rush of 1893 began in what I imagine was barely contained mass chaos. Prints above show: “One Minute Before the Start” Sep. 16th 1893 and N.W. cor “Chilloco Reserve Sept. 16th 1893. 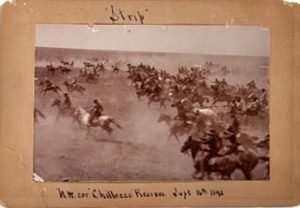 These historic images document the “rush” for new homesteads in the 225 mile long, 58 mile wide “Cherokee Strip” between southern Kansas and Oklahoma Territory. 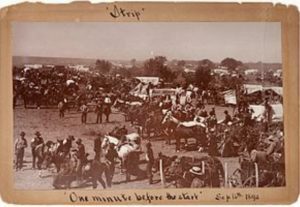 Sold by the Cherokee to the government, by the time of the opening, more than 100,000 people gathered on the border, nearly 30,000 alone around Arkansas City. At noon on the 16th, the homesteaders, most mounted on horseback, but others on foot and in wagons, “boomed” across the border to secured prime claims (wikipedia entry). A first hand accounting of the day can be found here. George Johnson, known as “Cook” may have been amongst this group of pioneers. 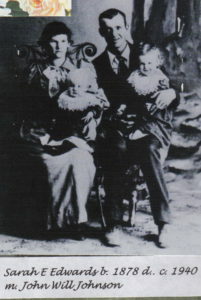 He settled in Rusk, Oklahoma, married Lucy Moore in May, 1895. They had nine children in ten years. “Cook” Johnson’s brothers, John, Charley, and Pete, decided to follow their brother’s lead, and in 1900, they began preparing to move their families and belongings from Emeline, Iowa to Rusk, Oklahoma. 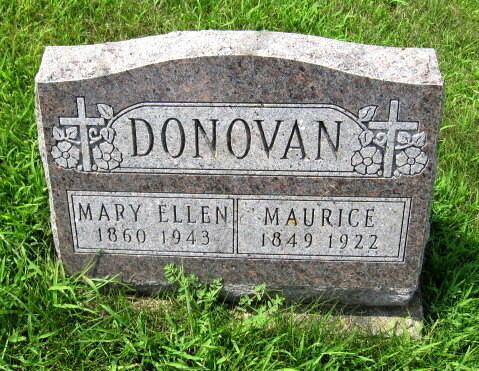 Gramma Donovan_s Trip in a Covered Wagon from Oklahoma to Iowa in 1901. 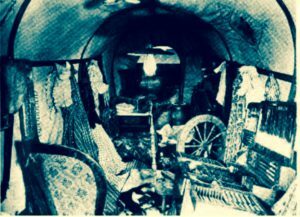 Contents inside a covered wagon! Where do the people fit in? Thank you, Mike Houselog for sharing this glimpse into our frontier families and a snapshot of what it was like at the time in day to day life – killing tarantulas? WHAT??? If we let our children do that now, we’d be arrested! Also, some historical perspectives, with President McKinley’s assassination, for example. What a great story, a fond memory for you, and now also for us.